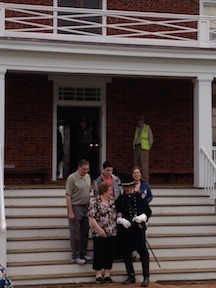 A living historian portraying Col. Eli Parker greeted visitors on the steps of Wilmer McLean’s house. The doors of Wilmer McLean’s house stand wide open–front and back–and a bevy of Parks Service volunteers stand ready to funnel the throng through. A Park Service ranger stands in the hallway to ensure no one enacts any mischief in the home as they breeze through. Where were they when Union officers cleaned the place out 150 years ago? I wonder. However, the throngs of yesterday are not putting on a repeat performance today, and most of today’s crowd seems to be gathered around the reenactment of the cavalry surrender that is about to happen on the opposite side of the Stage Road. Somewhere in the middle of the field, the lone grave of Lafayette Meeks is about to get swallowed up by horses. With everyone else seemingly distracted, I’m able to walk right into the McLean home and right into the parlor. I get it all to myself. I can’t believe it. I have been in this room before, so I don’t expect chills up my spine or a lump in my throat, and I don’t get one. But it is nice to stand here for a moment just the same. 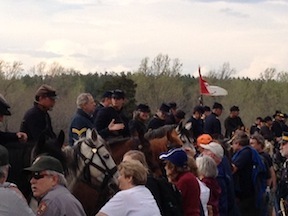 A reenactment of the cavalry demonstration drew a big crowd. I sweep down the back steps to the straw-covered path that leads away from the house. To mitigate the impact of so much foot traffic in the mud, straw covers many of the paths in the park this week. It gives the place a “state fair” feel. An encampment of Union officers has staked out next to the house, so I mosey through on my way to the cavalry demonstration. 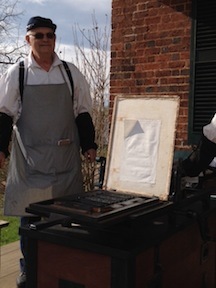 On the porch of the Clover Hill Tavern, a pair of printers roll off parole slips from a pair of hand-cranked presses. I get a parole slip–my only keepsake of the day beyond a few photos—before walking down to Surrender Triangle. On a small platform stage, a speaker begins a program about race and memory to full rows of people sitting on benches. In an adjacent field, a scaffold stage suitable for a rock concert faces a field of plastic folding chairs. 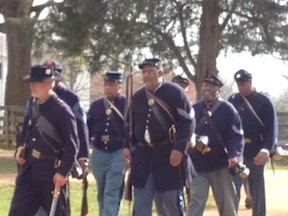 Living historians portraying USCTs marched along the Stage Road. Park Service “flat hats” are everywhere—not to mention NPS maintenance workers and law enforcement. They chat up visitors, answer questions, provide directions, and waved at passers-by in a friendly way. I see my friend Pete from Fredericksburg driving a golf cart. My ECW colleague Phill Greenwalt stands under a tent where he has been helping kids with coloring projects. All together, it is the Park Service at its very best. This is exactly why so many people love the NPS. Ironically, it’s an off-duty Park Service historian who helps me wrap up my day. When I get on the shuttle bus to head back to the parking lot, my friend and mentor Greg Mertz spots me and calls my name. I sit with him, and we chat all the way back to the parking lot. This is the man who, more than anyone, has taught me how to be a good public historian. I have heard several people describe him as “the best Civil War historian you have never heard of,” and compared to the Who’s Who of Civil War Historians that’s paraded across my Facebook this week, that’s true. Greg doesn’t have the rock-star reputation others do, but I seriously don’t know a finer historian. As we chitchat about work-related stuff, I am secretly pleased to be wrapping up my 150th commemorations with the man most responsible for my own Civil War career. Printers gave me my parole so I could leave. For months, I had dreaded possibility of going to Appomattox. The circus that was the Gettysburg sesquicentennial made me worry that Appomattox would be just as mad—but with one important distinction. Whereas Gettysburg had twelve roads in and out of the town, Appomattox has one, which passes straight through. I’ve had nightmares about it. The introvert in me wanted to skip it all and come at a quieter time—which I’ll still do—but I knew I would kick myself in the future if I didn’t come at some point during the weekend. And so my own road took me to Appomattox. It gave me opportunity to say thank you to men past and present who’ve inspired me to tell the stories I tell—their stories. This entry was posted in Battlefields & Historic Places, Memory, National Park Service, Sesquicentennial and tagged Appomattox, Appomattox Court House, Eli Parker, Greg Mertz, National Park Service, NPS, Sesquicentennial, thoughts-on-Appomattox, USCT, Wilmer McLean. Bookmark the permalink. …and thank you for telling us your story with such soul and meaning. For those of us who could not be there (but whose hearts have dwelt nowhere else these past days) it has been helpful to have your inner musings. Nevertheless, thousands of people planned, came, remembered, hosted, lectured, portrayed and enacted. So many care regardless of whether it goes unnoticed or is disdained by the media and academia. Good!! Remembering is a powerful thing connecting one to significance and an ever-unfolding understanding. Thanks to all of the great writers of this site who help that to happen for us!